These TO&A Deposition Services are situated in the beautiful Hilton Garden Inn, located on the banks of the majestic Colorado River. This superb location offers our on-the-go court reporting clients the best in convenience, efficiency and professionalism. 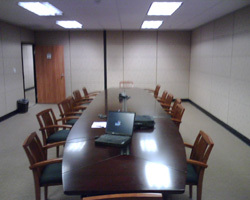 The exquisite Boardroom will provide the most modern and high tech facilities in Yuma. As always, our friendly support team is on-site and available to provide exceptional litigation support services.